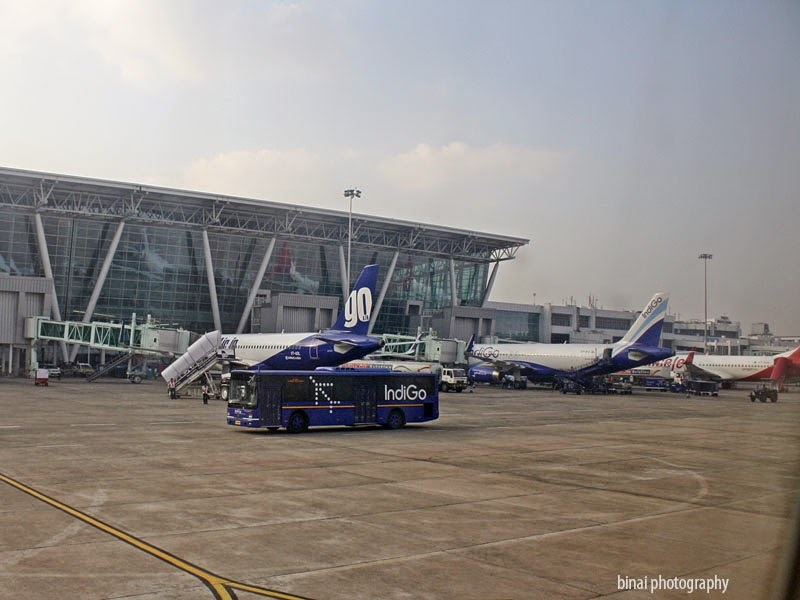 After pocketing a cheap ticket from Hyderabad to Chennai on Indigo, I was on the lookout for fares for Chennai to Bengaluru. I briefly romanced the idea of taking a bus, but then decided to fly. The cheapest rates were being offered by Air India and Jet Airways - AI was ruled out since it was too early. So the choice was Jet - there were two flights at "late morning" - I did not want to take an early flight, since I wanted to sleep a bit. Among the two late morning flights, one was an ATR and the other a Boeing 737-700 - both sold at the same price. 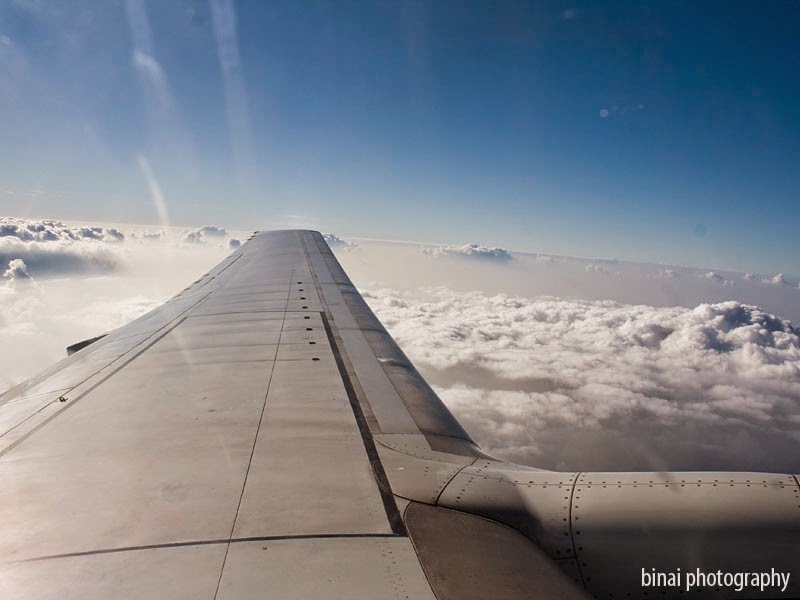 It was a no-brainer decision to opt for the B737 - its been long years since I flew in a B737-700. Being Republic Day, I anticipated tighter security, and hence I started off earlier. I was at the airport by around 0650hrs. 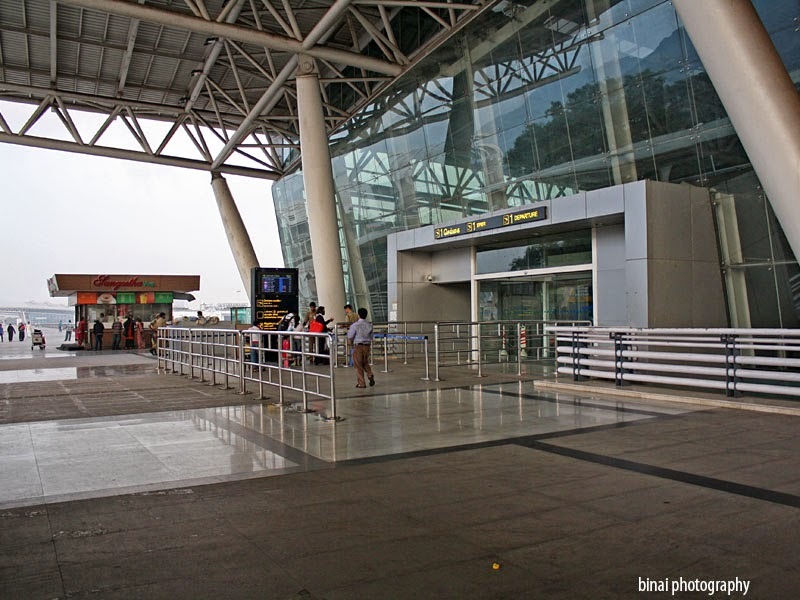 This was my first visit to Chennai airport (discounting my inbound flight the previous night) - the airport had the typical Airport Authority of India design - full of glass and ACPs. The characteristic rounded box shape. 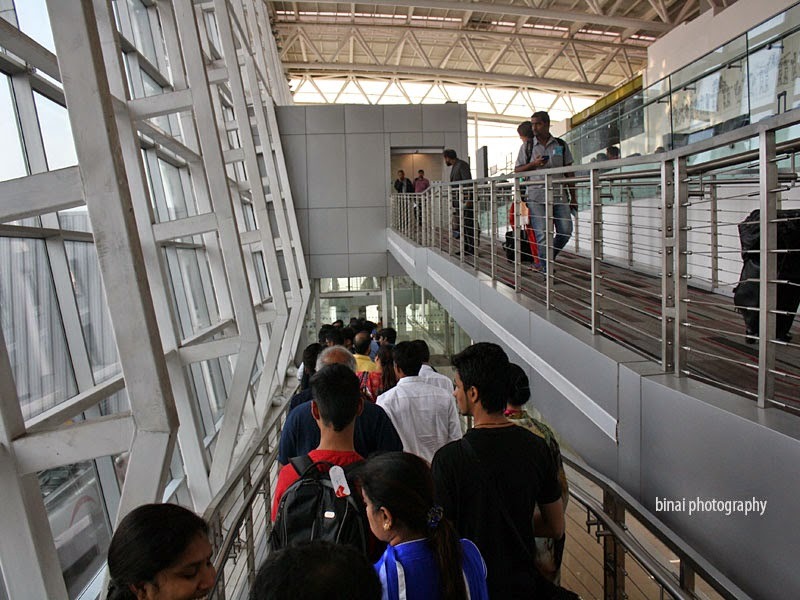 The Arrivals and Departures are vertically seperated - a long flyover takes passengers to the upper level for departures, while the lower level is used for Arrivals. Its actually three levels - and not two. The mid level is where the jetways are connected to - but has only a common area for the incoming passengers, who'd take an escalator to reach the arrivals hall on the ground floor. The other side of Domestic Departures.. There is one more gate up ahead. The domestic and international terminals are in different buildings, on the same side of the apron. 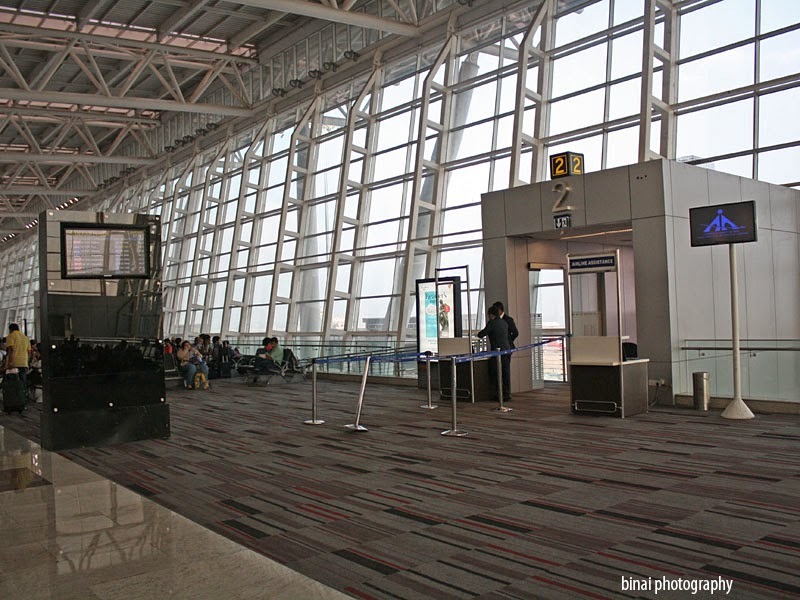 The check-in counters for JetAirways was near Gate 1, and boards on the kerbside did segregate entry gates. The security check at the entrance was smooth - the guard quickly verified my ticket and let me in. 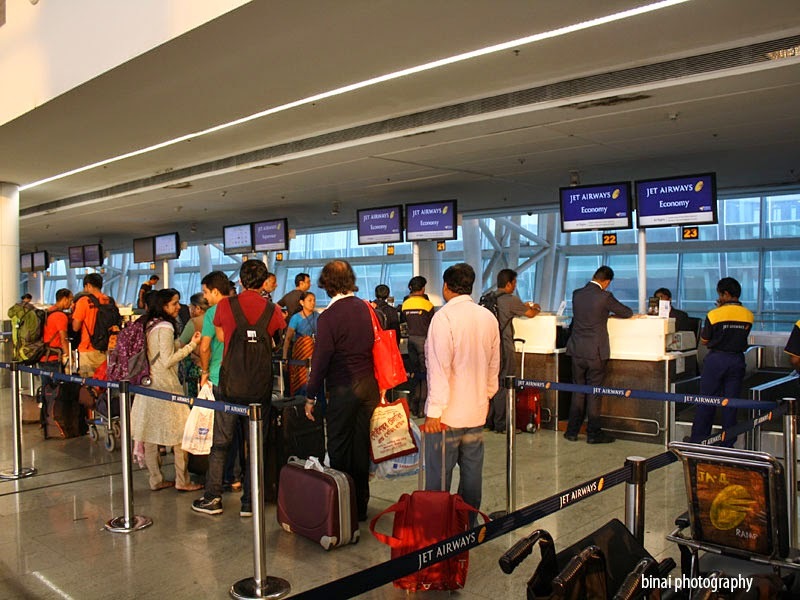 I was quite shocked that a Metro-City Airport like Chennai did not have in-line baggage scanning - there were check-in baggage scanners near the check-in counters - I got my check-in bag scanned and then proceeded for check-in. The queue for check-in was not so long - joined the line, which was moving fairly fast. When my turn came, the baggage tag printer got jammed - the agent tried her best to set it alright - but it didn't budge. She then headed to the supervisor counter and got a reprint. I got my boarding pass at 0705hrs, and then headed towards Security check. My boarding pass said "Jet Konnect" - all for Jet's "One Brand" thingy. The flight number said S2-4607 MKT 9W 7008. This confirmed that this schedule is operated on JetLite's AOP, and not mainline Jet Airways. For some reason, a CISF Guard at the entrance of Security check verified boarding passes and only passengers of certain airlines were let in - is there another security check area? Security check was done by 0712hrs and I was in to the security hold. My flight was from Gate-2 - being my first time to Chennai, I took my time looking at what all Chennai offered. Eating options were really limited - just a few stalls selling sandwiches and such stuff and a few stalls selling Maggi! There were "food courts" at either ends of the terminal building, but my ankle sprain did not let me walk that far. I was quite hungry, and picked up a sandwich from a stall there. The Sandwich was from Cafe Coffee Day - but the shop did not have any Coffee Day boards. After a quick visit to the washroom, I sat down to track my aircraft on FR24. 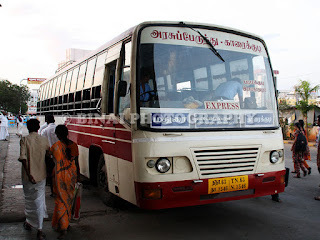 I understood that VT-SJA was coming in to take me to Bangalore - the aircraft was already close to Chennai by then. 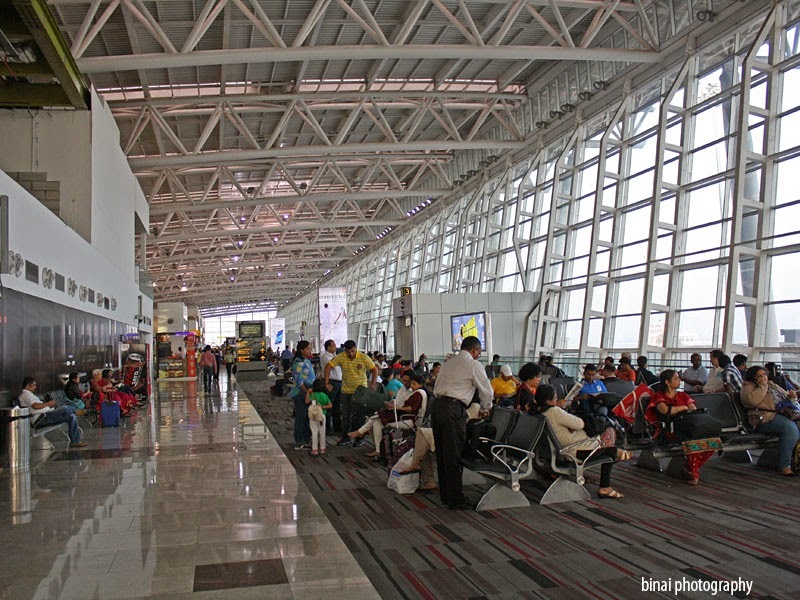 In the meantime, Air India announced a delay for their flight to Mumbai and requested their passengers to head to the food court for breakfast. 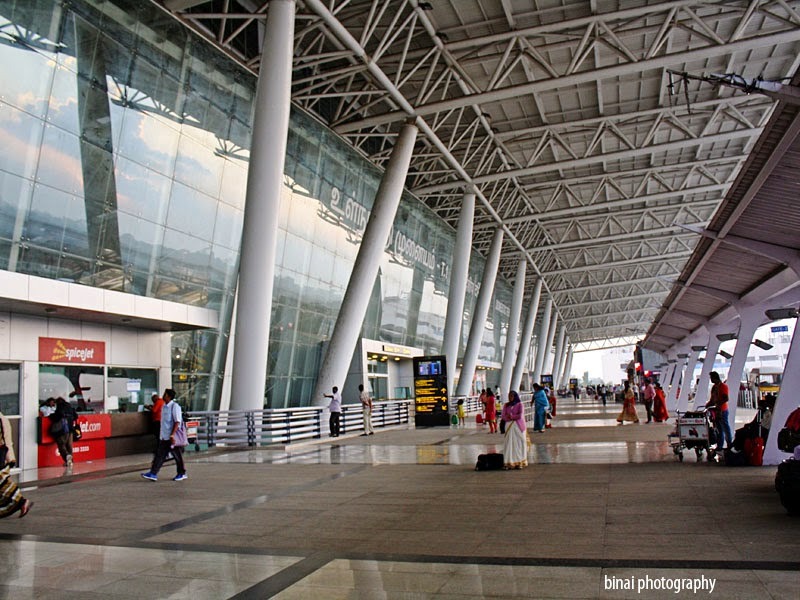 SpiceJet announced a delay for their Bengaluru flight - due to bad weather in Bengaluru. But then, Jet Airways was perfectly on time from Bengaluru! However, a few messages on WhatsApp did confirm that the Weather in Bengaluru was bad - visibility was below minima. 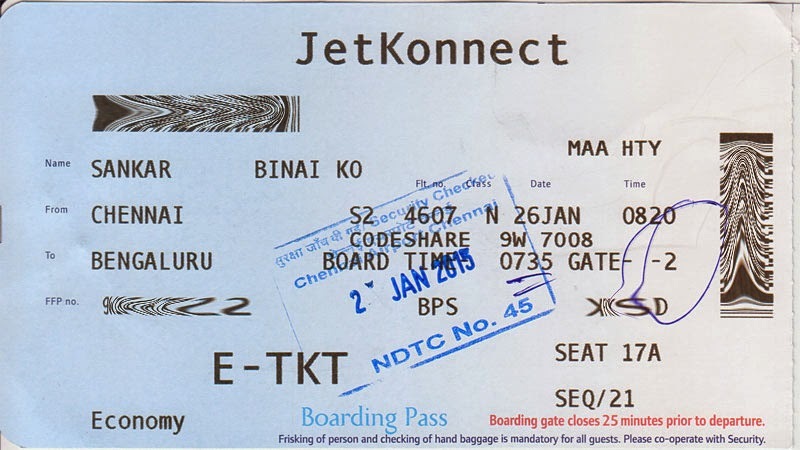 Thats my boarding pass - still saying JetKonnect, with two flight numbers.. Sometime around 0836, VT-SJA came in and docked at the gate. Deplaning was very quick - from what I could see, the incoming flight was full. The aircraft works a BLR-MAA-BLR-DEL-IXJ-DEL-BLR-MAA-BLR rotation - and two aircrafts have been doing this rotation - VT-SIZ and VT-SJA. I got the latter today. VT-SJA is a Boeing 737-700 (without winglets), delivered originally to Air Sahara in May 2005. The aircraft was then taken over by JetLite (following the buy out of Air Sahara by Jet Airways). The aircraft is painted in the characteristic JetKonnect Livery (often mocked as the Harpic Blue livery). The aircraft was configured as 8 seats in Business class and 126 seats in Economy - totaling 134 seats. This would be my first B737-700 ride in almost 10 years, and I was quite excited about it. This would also have been my first in a JetAirways Boeing - but then this was a JetKonnect service. That is Gate #2.. before boarding call was made. The first Boarding call was made at 0745hrs - as usual, zone-wise boarding was called. The queue was already long, and hence I just joined somewhere at the back. I passed the gate at 0753hrs - one walks down from the gate to reach a lower level, and then enter the Jetway. There was the usual CISF check just before the jetway, and then one checking by the Airline staff, who also tore off the stub. I was inside the aircraft at 0800hrs - yes, that is slow - all thanks to the crowded aisle inside the aircraft which delayed boarding. I found somebody already sitting on my seat - I called a FA standing nearby, who quickly verified the boarding passes and found that the other person was sitting on the wrong seat. I quickly occupied my precious window seat. The long queue to get into the aircraft. Boarding was completed by 0810, doors armed and we were all set to be pushed back. 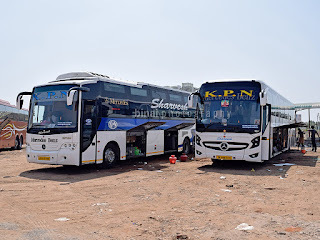 The welcome announcements followed - the announcements said "Jet Aiways" and not Jet Konnect. Safety demonstration followed. In command was Capt. 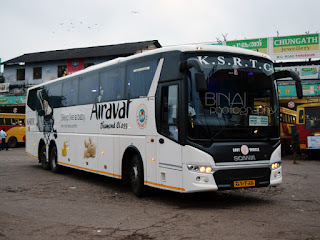 Rajiv Chaudury - I couldn't get the FO's name. Pushback commenced at 0812hrs. We started taxi at 0815hrs - well before scheduled time. We had to hold for a minute before being let on to the runway - we were on Rwy07 at 0820, and were airborne at 0821hrs. We took off towards the East, banked left twice and headed to the west. The Koyambedu flyover looked great from the air - I missed seeing the bus station though. We climbed quite fast. Soon after the seatbelt sign was turned off, the on-board service comments - of course, not without the "Jet Airways is now a full service carrier" announcement. Taxiing out... you can see all the three main LCCs here.. Shortly after reaching cruise altitude.. They offered only a Veg option - its a very short sector, and really doesn't make sense to have variety. With a flying time of only around 30 minutes, they had to be real quick with service, and they were fast as well. 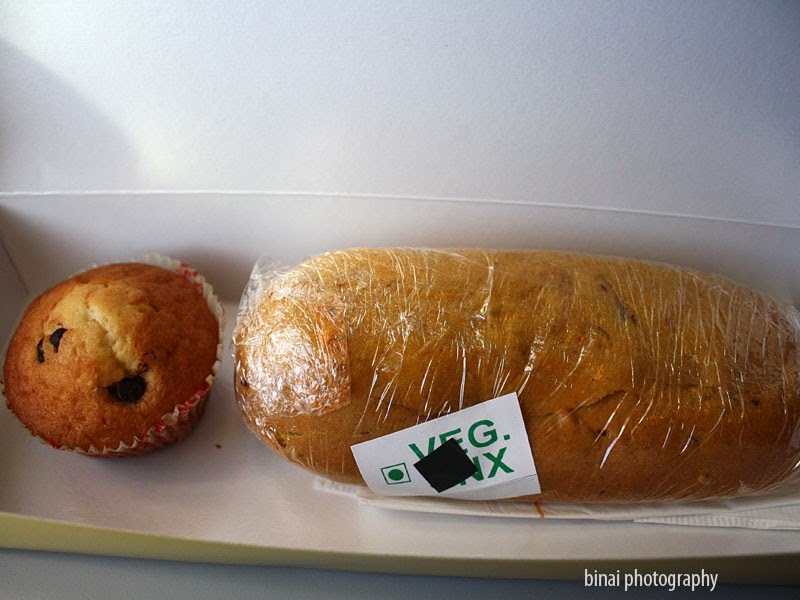 The veg service had a Paneer Bread roll, a chocolate muffin, a tamarind candy and a bottle of water - of course the SkyMart brochure as well - all in a snack box. The Bread roll was really soft and the filling was good (tasted exactly like the one I had on the COK-BLR leg, but with softer paneer this time). The muffin was slightly on the dry side - not a deal breaker though. No hot beverage service was offered though. The attendants started clearing the thrash even before the entire cabin was served. 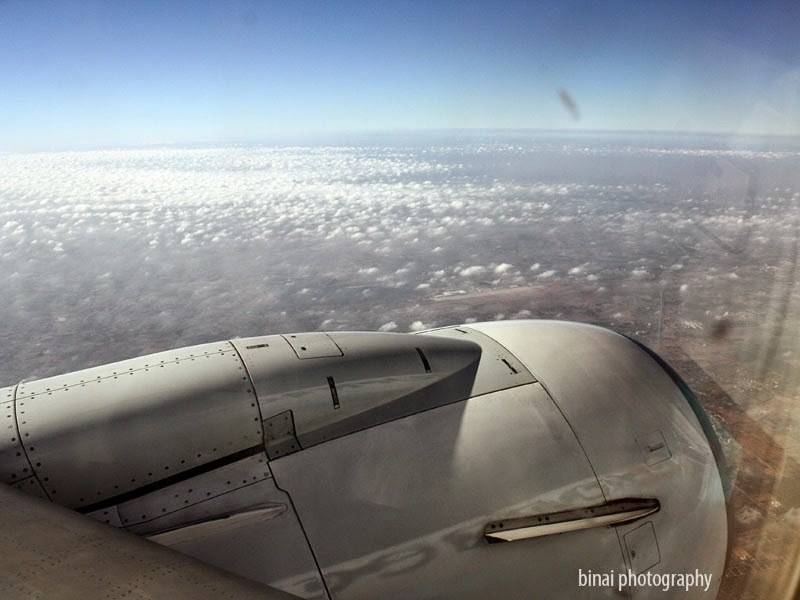 The seatbelt sign came back on, and landing was announced around 0845hrs - we were overflying Bangalore by now. I love seeing the airport from the air - and had purposefully booked a seat on the left side for that. 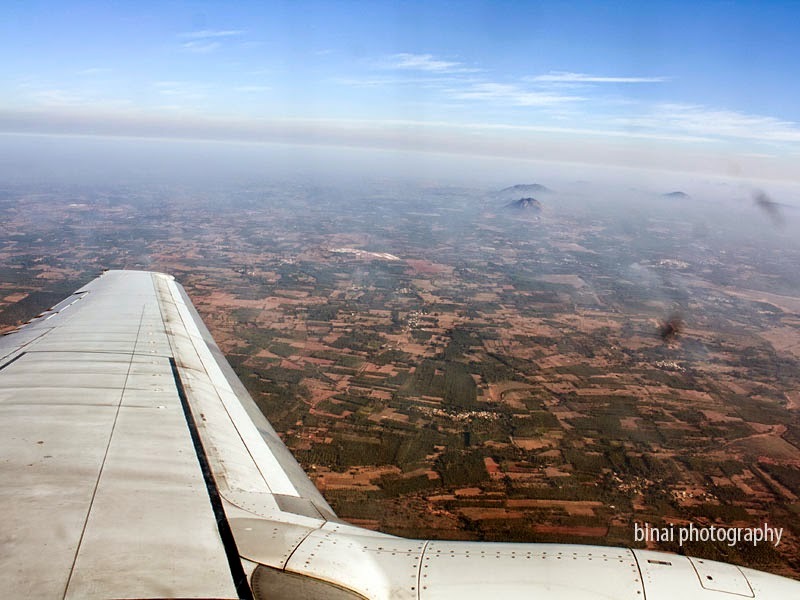 While we continued heading to the west, atleast three other aircrafts were ahead of us for landing. It was fun watching aircrafts race one behind the other to the runway. Very soon, we also joined the queue, aligned to the runway and started our finals. We finally touched down at 0901hrs on Rwy09. It was then a short taxi to the apron - we taxi'd parallel to an Air Costa E-170 (VT-LNR) escorted by a "Follow Me" Vehicle, and finally docked at Stand 17, at 0905hrs. 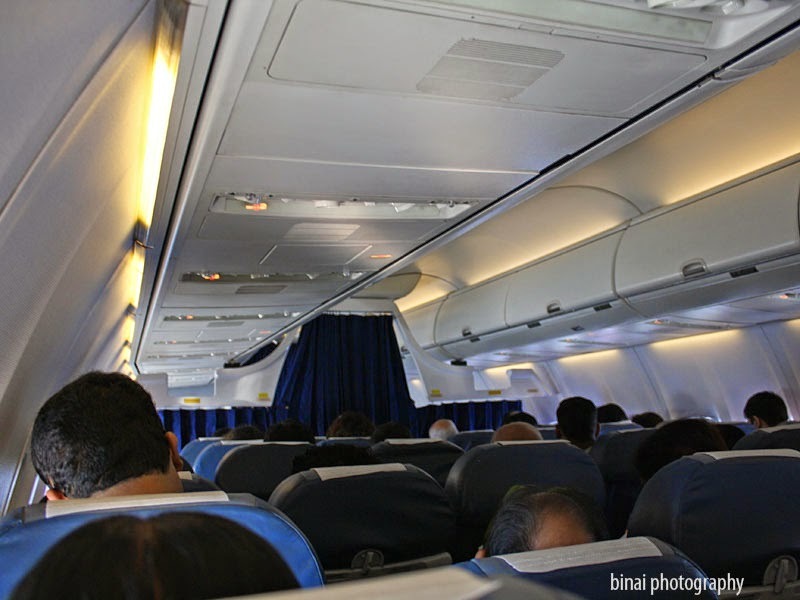 It took some for the Jetways to be fixed, and by then the aisle had people jostling for space - people hurried with opening the overhead bins and some of them kept pushing forward. I sat down watching the show till there was a gap in the queue - I got off at 0911. The bags took some time, and mine came only by 0920. I was out of the airport by 0922, and got into a bus by 0930. 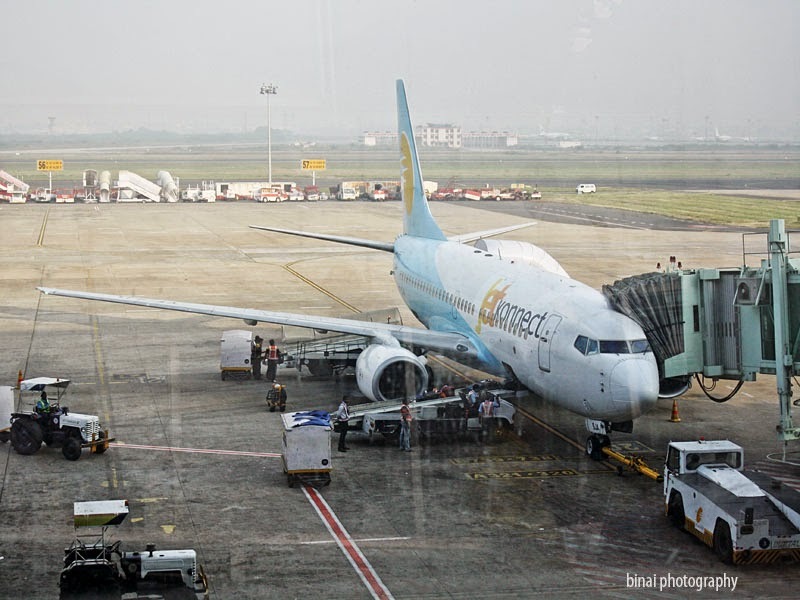 This was my first flight in a Jet Airways Boeing aircraft (this was a JetKonnect flight, speaking strictly) - all my previous flights were in their ATRs. This particular aircraft was almost 10 years old (4 months shy of being a decade old) - the interiors were in great shape. The aircraft was really clean - including the windows (there surely was a bit of dust, but I'd pardon that). The flight crew were great - the service did have the warmth. The purser did get konfused when making the thanking announcement after reaching Bengaluru - the ghost of JetKonnect still flies on Jet Airways. Since they operate on two different Operator Permits, they still have problems with the "one brand" idea - but instead of confusing passengers more with the 9W flight numbers on the ticket - they'd be better off putting only the S2 flight numbers - the FIDS in the airport still displays only the S2 numbers.